Excited and maybe still a little giddy with jet-lag, we woke up at the crack of dawn on our second day in Vietnam ready to go out and explore. Our first stop of the day was a treat reserved for the early birds. In a corner of Tao Dan Park sits a cafe where proud songbird owners display their pets in decorative wooden cages each morning. Under the cages locals sit and enjoy a cup of coffee and a smoke, starting their day off right in the musical and vibrant atmosphere. 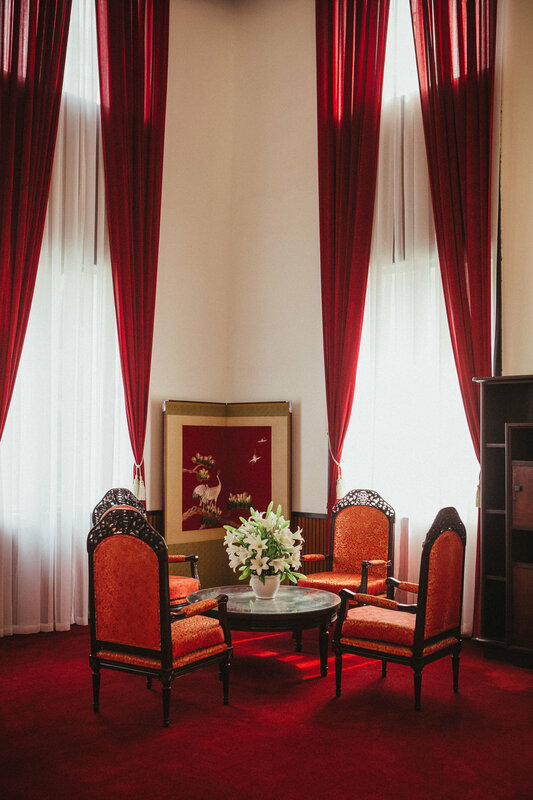 After visiting the bird cafe, we wandered to a bustling area nearby and checked off some of the must-see tourist destinations in HCMC including the War Remnants Museum and the Reunification Palace. The above photo of the palace is a prime example of the frozen-in-time 1960's decor that makes the attraction a visual delight. Both the War Remnants Museum and Reunification Palace are brimming with historical significance and are well worth their near giveaway entrance fees.